Looking for more clues to my family’s past, I decided to visit Old Mount Carmel Cemetery in Queens, New York, where a number of my ancestors on the Landes side are resting. Last weekend, I ventured into Queens with my camera to document, headstones, footstones, and overall gravesites, and it was a hot day to walk around with a large camera around my neck. The location was easy to find, and the relatives were buried in proximity to each other. 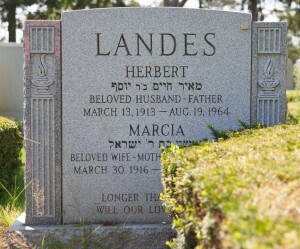 I first came upon the stone indicating the burial of my great grandparents Joseph Landes and Sadie Lustig Landes. 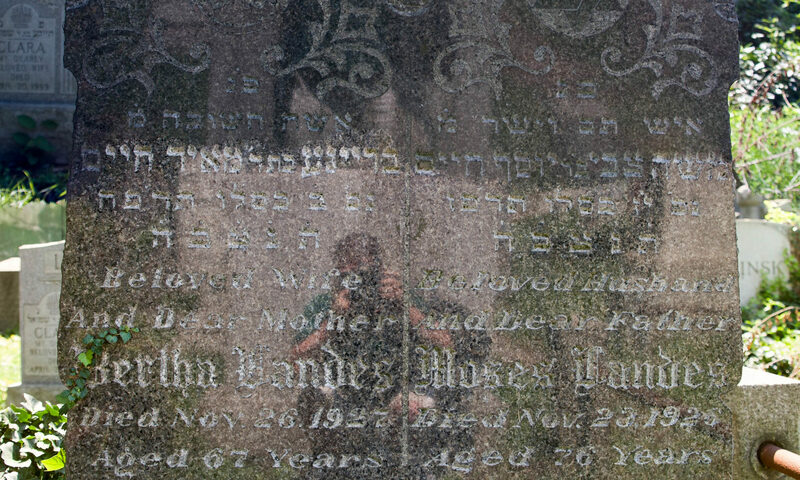 Directly behind their graves were Joseph’s parents, Moses Landes and Bertha Jereslawitz Landes. 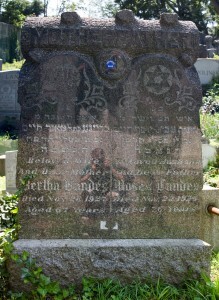 Across the path were the graves of Joseph’s sister, Sadie Landes Paltiel Goldenberg, and her husband Adolph Goldenberg. Behind the resting place of Moses was Joseph’s brother, Charles Landes, and Charles’ wife Clara. I wasn’t able to gain much new knowledge from this trip other than Hebrew names in some instances, but it was an opportunity for me to solemnly contemplate the life of an immigrant in the late nineteenth century and ask some questions with the hope that somehow they might be listening. The inscription for Bertha confirmed the death certificate I had, though it listed her parents’ last name as Goldenberg, is the correct certificate. I still have many questions about the travels of Moses, Bertha, and their family, presumably from Romania throughout Europe, making their way to England, then Canada, and finally arriving in New York City by the early twentieth century. There is still so much I don’t know. That day, I also visited New Montefiore Cemetery on Long Island. My grandmother passed away just over three years ago, and I attended the burial here. I came back to visit her, Marcia Kerstman Landes and my grandfather, Herbert Landes, whom I had never met. I am named after Herbert; we share the same Hebrew name. Also buried in New Montefiore Cemetery is my cousin, Alan, who died of HIV/AIDS at the age of 34. After some searching, I was able to find his resting place. New Montefiore is located near a number of cemeteries, and on my way there, I passed Beth Moses Cemetery. I confirmed this was the cemetery where my maternal grandfather, Seymour Berman, was resting, so I stopped there as well. Seymour’s grave was easy to find. It appears that his Hebrew name isn’t correct on the stone, or if not incorrect, doesn’t match my previous information. I haven’t studied the language since high school, but his ketubah clearly indicates his name is יהושע בר שמואל (Yehoshua bar Shmuel), while the engraving offers the alternative ישעיה בר שאול װאלף (Isaiah bar Shaol Volf). This is the first confirmation I’ve found that Seymour’s father’s given name was Samuel Wolff, not just Samuel. If I find myself with more time of exploring, I will visit Samuel Wolff Berman’s resting place at Mount Hebron Cemetery in Flushing, New York, and I’d like to visit the New York addresses of my ancestors, particularly where the buildings and houses in which they lived are still standing.